PLEASE NOTE: Country overshoot days will be updated with the new edition of National Footprint Account data in April 2019. A country’s overshoot day is the date on which Earth Overshoot Day would fall if all of humanity consumed like the people in this country. we can determine Switzerland’s overshoot day as 365 * (1.68/ 4.85) = 126th day in the year. The 126th day is the 7th of May, the Swiss overshoot day (in 2014). By way of the country overshoot equation above, a country will only have an overshoot day if their Ecological Footprint per person is greater than global biocapacity (1.68 gha). Countries whose Ecological Footprint per person are less than global biocapacity (1.68 gha) do not have an overshoot day and are therefore not included in our list below. 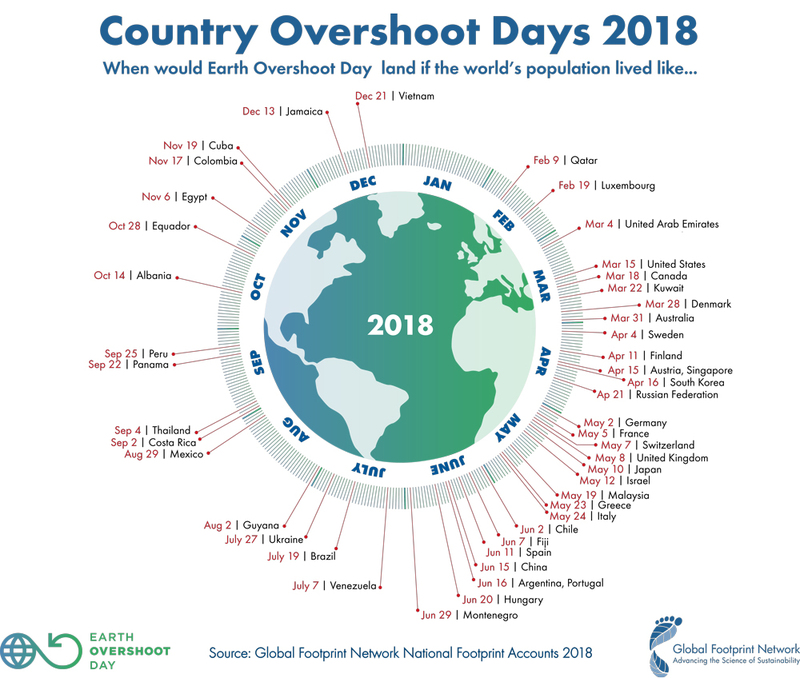 Countries’ overshoot dates are calculated with Global Footprint Network’s National Footprint Accounts, which are updated annually. You can download a free package containing the latest results of the National Footprint Accounts 2018 Edition in an excel workbook at https://www.footprintnetwork.org/licenses/public-data-package-free-2018/. This 2018 edition features national data from 2014, the latest year available from the United Nations. You can also view results at data.footprintnetwork.org.